Lynden Transport Driver Jack Sorensen was recently named the 2018 Alaska Truck Driver of the Year by the Alaska Trucking Association (ATA). 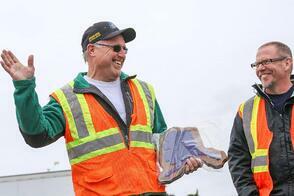 Lynden drivers have been named Driver of the Year four out of the past five years. Lynden Transport Driver John Schank received the award twice – in 2014 and 2017 – and Alaska West Express Driver Brian Ambrose was recognized in 2016. Brian was named second place overall champion of this year's competition on May 19 as well as taking first place in the sleeper truck class. Pictured above from left: Jim Jansen, Justus Uphus, Jack Sorensen, Brian Aszmus, Doug Longerbone and Brian Ambrose. "We are extremely proud of the professionalism and commitment our drivers exhibit every day on the job, but also the knowledge and skills they bring to the annual ATA truck driving championships," says Lynden Transport President Paul Grimaldi. "These drivers are the best of the best. They must complete a written knowledge test, a pre-trip inspection and a skills course as part of their participation." Jack has earned many first-place finishes in the annual driving competition in Anchorage and has maintained an accident-free record for 34 years. He has traveled to the national truck driving competition seven times over his long driving career. "Driving in Alaska can certainly be a challenge with moose on the road year-round, tourists on the road in the summer and extreme weather in the winter," he says. Lynden Transport Driver Doug Longerbone took first place in the five-axle category, Greg Sims, seventh place in the five-axle; Brian Aszmus, fourth in the stepvan and Cody McFarlane took fourth place in the four-axle class. Alaska West Express Driver Joseph George placed fourth in the five-axle, James Elliott took third in the four-axle and Edward Tuia placed fourth in the flatbed class. 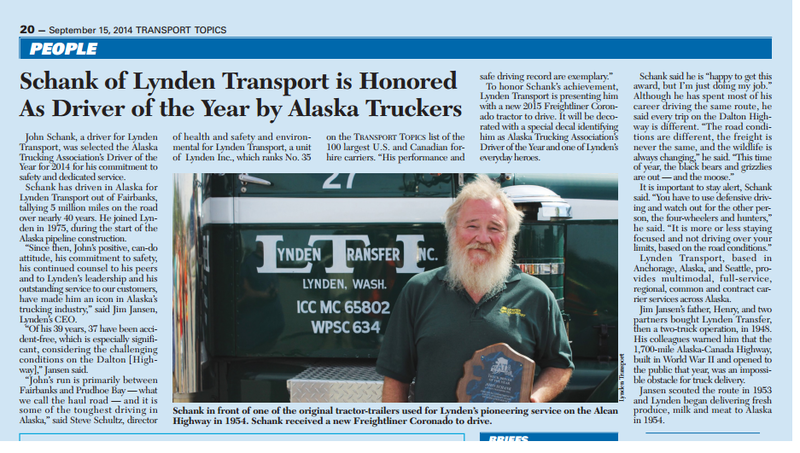 When John Schank started driving for Lynden Transport in 1975, he probably never imagined he would be named the Alaska Truck Driver of the Year, not once, but twice. The Alaska Trucking Association (ATA) presented John’s award this summer at a special event in Fairbanks. In addition to that honor, John was recognized for setting a new record as the first Lynden Transport driver to log 40 years of safe driving – 5,360,000 miles to be exact. Starting with the opening of the Dalton Highway in 1975, John has been driving one of America’s most treacherous roads: the haul road between Fairbanks and Prudhoe Bay. The haul road is known for extreme grades and extreme weather. John still drives the route today, making the 1,000-mile round trip twice a week. "John is a true professional," says Lynden Transport President Paul Grimaldi. "He was named ATA Driver of the Year in 2014 and participates in the annual ATA truck driving championships each year. He received a letter of commendation in 2014 from former Governor Sean Parnell for his driver of the year award and from Governor Walker for his awards." He also received a letter of congratulations from Joe Marushack, President of ConocoPhillips Alaska, and Janet Weiss, President of BP Alaska, for helping these Lynden customers continue to safely perform their work. "Receiving the ATA Driver of the Year again this year, along with his award for 40 years of safe driving for Lynden Transport, makes us all very, very proud," says Paul. The highlight of John’s career was being chosen to transport the 2015 U.S. Capitol Christmas Tree from Seward to Anchorage and from Seattle, WA to Washington D.C. "It was my honor," John says. "I stopped along the way for community events and met a lot of kids who thought I was Santa taking the Christmas tree to the White House. I’ll never forget it." "For 43 years, John has been climbing behind the wheel and doing his job safely and as the quiet professional," says Lynden Chairman Jim Jansen. "He exemplifies the Lynden Everyday Heroes who consistently, efficiently and safely serve our customers. 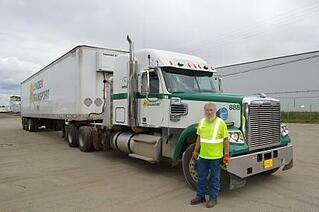 John has set the standard for drivers on the haul road with a spotless safety record. We are proud of him and his commitment to safety while driving in the most challenging conditions in the nation." Following in the footsteps of Lynden Transport Driver John Schank of Fairbanks, Brian Ambrose of Alaska West Express was named 2016 Truck Driver of the Year by the Alaska Trucking Association (ATA). Brian’s award was presented at the 17th annual ATA truck driving championships in Anchorage where Lynden truck drivers competed. Drivers also competed at a truck rodeo in Kent, WA in June, turning in impressive performances as usual. “Brian has 36 years of commercial driving experience including 16 with Alaska West Express,” says Anchorage Service Center Manager Dave Heston. “And he has more than 3 million miles in the seat and 13 consecutive years without an accident. He has driven all types of configurations on Alaska’s highways, including heavy haul up to 13-axles and tankers.” Brian has competed in the truck driving championships every year since 2005 and has collected an assortment of trophies including three for state champion and best overall in 2015. In the June 18 competition in Kent, WA, Lynden Transport Driver Dan Jenkins competed in the Flatbed Division as a rookie and Brown Line Drivers Vincent Hannick, Carl Carter and Michael Kidrick competed in the Sleeper Berth division. 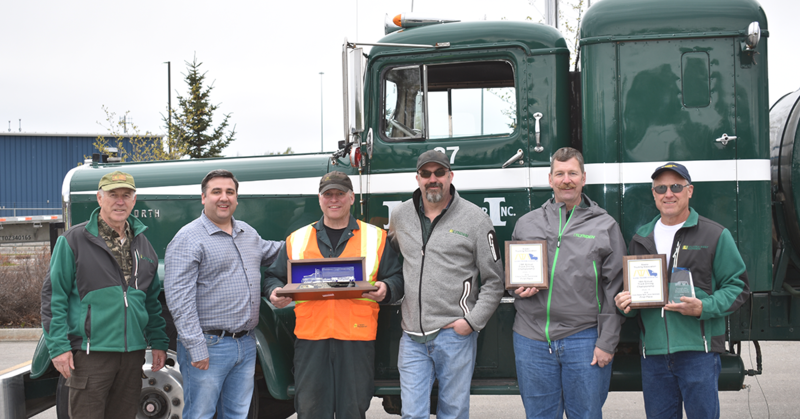 Ten Lynden Transport drivers competed in the Alaska competition, including Jack Sorensen, placing first in the 5-axle Tanker Division, and Tanner Heisler, placing third in the 5-axle Flatbed category. Other Lynden competitors were: Randy Estrada, Chris Hudson, John Phillips, Cody McFarlane, Doug Longerbone, Pha Lee, Stephanie Winder and Jay Capala. Brian Ambrose, David Lambe and Edward Tuia competed for Alaska West Express. Lynden’s Deskbound Geezers were on hand to steer Old No. 27 through the cones.